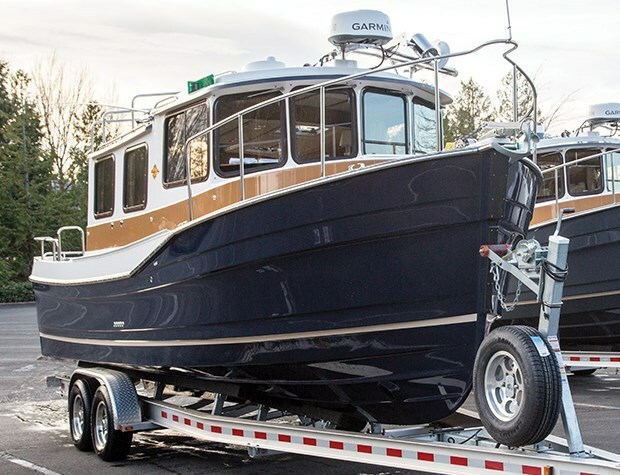 The R-27 is this Kent, Washington boat builder’s newest model easing nicely in the mid-range of its five model line-up between the smaller R-21 and R-25 and the two larger R-29 and R-31 models. 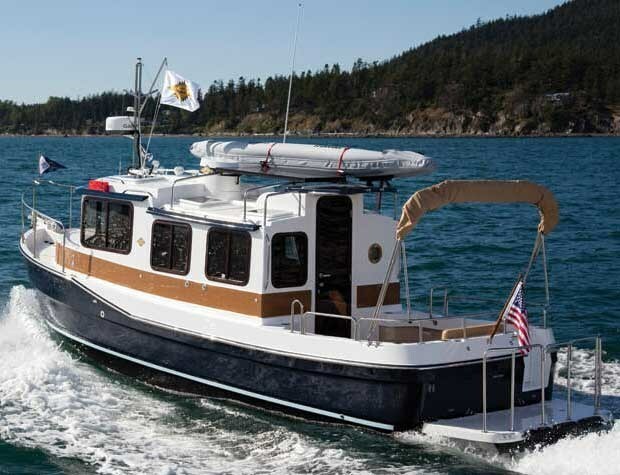 With its eight foot, six inch beam, it is also Ranger Tugs’ largest legally (i.e. without a permit) trailerable model. This new R-27 is nearly identical in layout and in many specifications to the original R-25 but is two and a half feet longer on the identical eight and a half foot trailerable beam and weighs seven hundred pounds more at 6,950 pounds dry weight. Where almost the entire extra length is found is in the fifty percent larger cockpit which on the R-27 is almost fifty square feet. What this extra cockpit room has achieved is to have the entire standard 200 hp Volvo D3 diesel housed within the cockpit aft of the cabin bulkhead to reduce considerably any noise in the cabin while underway. This extra cockpit space has also allowed an increase of 20 gallons or twenty-five percent increase in fuel tank capacity to 100 (US) gallons in the R-27 over the original R-25. On the starboard side of this cockpit is a huge in-floor storage compartment plus a smaller storage locker within the starboard side molded-in entrance step. On the port side is a separate in-floor compartment for the four standard batteries plus another in-floor compartment with the four battery switches plus room for the optional Mase diesel generator with sound shield. Cockpit seating is provided by a standard two-person stern bench seat. A starboard side transom door within this deep cockpit provides easy access to the standard swim platform complete with an integrated, recessed, and covered four-step telescoping stainless steel boarding ladder plus three large ribbed fenders built in to the aft face of this platform to act as handy protective “bumpers.” Surrounding cockpit safety railing is high and extra high boarding-assist railing is provided alongside each side cockpit entrance step. A full-height glass door opens to the cabin which is surrounded by large windows providing abundant natural lighting with the side windows being opening and screened. A total of six overhead hatches with screens provide lots of cabin ventilation. 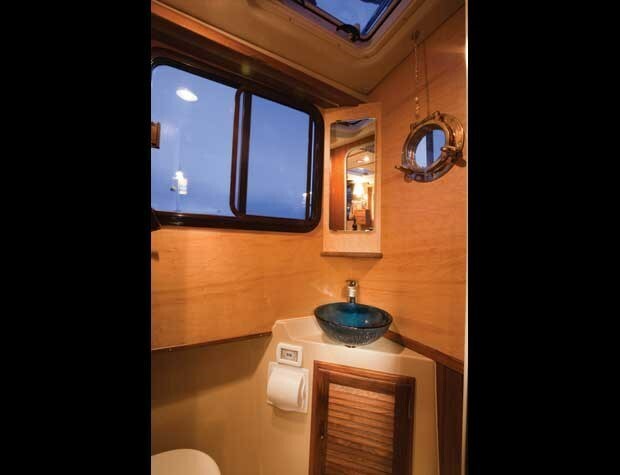 The four windows across the front of the pilothouse are all provided with a standard windshield wiper and windshield defrosters. 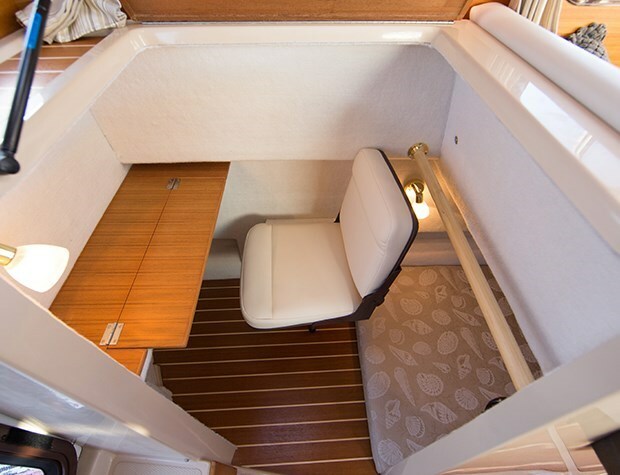 The large comfortable four-seater teak dinette table centred on the port side of the cabin is on a piston pedestal for easy conversion of the dinette to a double berth. The forward seatback for the dinette flips back to allow forward-facing two-person companion seating. On the bulkhead ahead of this companion seat is a handy glovebox plus the standard Fusion AM/FM stereo with iPod connectivity and four speakers. There are five storage lockers within the cabin with louvered teak doors. The entire cabin is finished in warm wood. 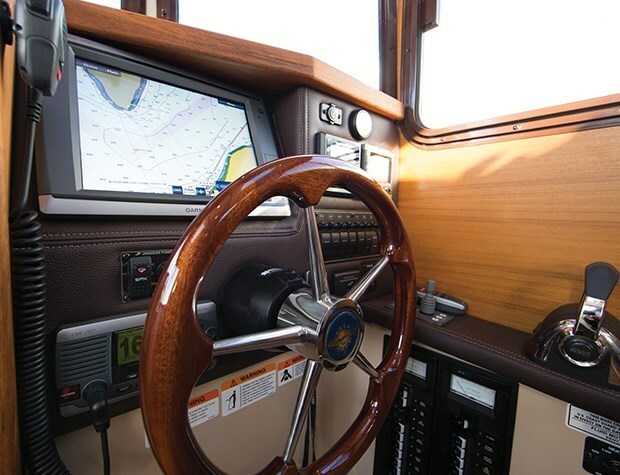 The helm features single lever electronic engine control, full colour electronic instrumentation display including fuel flow data, Garmin VHF radio, plus standard spotlight, trim tabs, anchor windlass, and both bow and stern thruster remote controls. The new swivel helm seat also flips up to provide additional galley counter space. 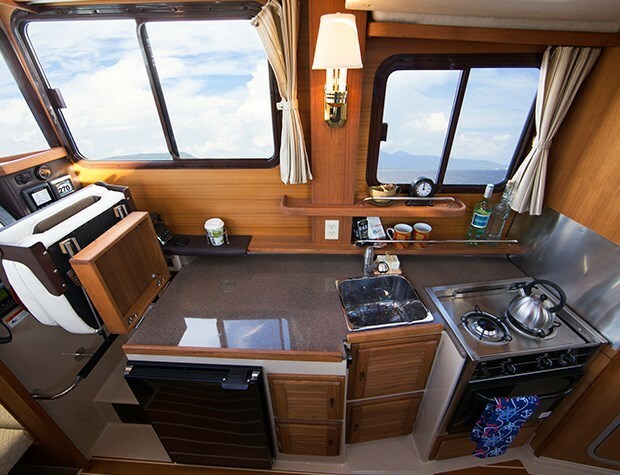 Aft of the helm, the starboard side galley features a deep-drawn polished stainless steel sink, standard two burner electric stove with oven, microwave, 1,500 Watt power inverter, and below counter electric refrigerator. The cabin sole is traditional teak and holly. 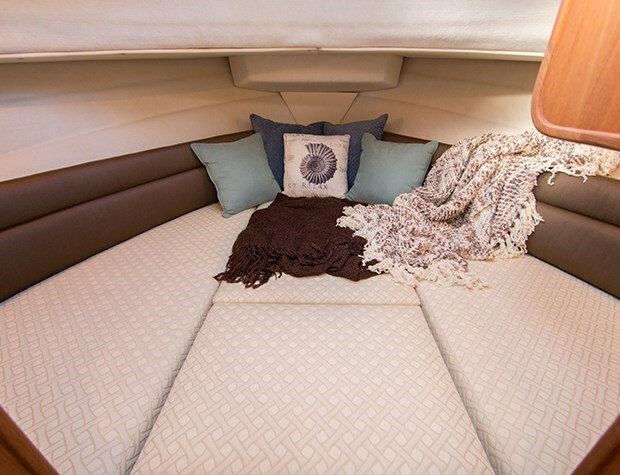 Above the companionway leading down to the forward six foot, five inch long private V-berth cabin is a standard flip-down 19-inch TV/DVD player. Other notable standard equipment includes a bow anchor locker plus stainless steel self-launching anchor roller, folding stainless steel mast, sport racks with removable stainless steel ladder, raw water washdown, plus a cabin heater. 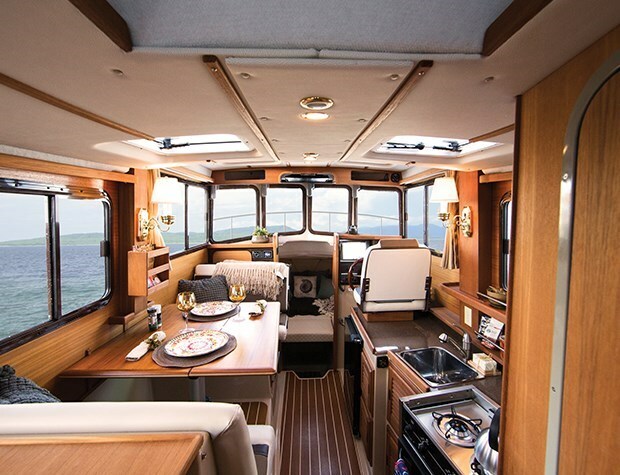 Notable optional equipment includes reverse cycle air conditioning/heating, Garmin autopilot, Garmin 7212 chartplotter with radar, propane stove and oven, Webasto diesel forced air cabin heater, cabin carpet runner, swim platform safety railing, underwater lighting, cockpit bimini, and even a Kyocera 140 Watt solar panel. You may also want the rigid bottom inflatable with weaver davits, stand-offs and winch. The R-27 becomes a great and desirable addition to Ranger Tugs’ lineup.